Bangalore Literature Festival (BLF), the flagship literary event on the cultural calendar of Bangalore city, is all set to roll out its fourth edition on December 5th and 6th 2015 at Hotel Royal Orchid, Old Airport Road. The BLF has emerged as the second largest literary conclave in the country that brings the best of minds in the world of literature to Bengaluru. Building on the success of the earlier editions, this time the festival brings together nearly a hundred stalwarts from the world of literature, in various languages, both from India and abroad. This edition has multiple focus themes. The recent debates across the country on intolerance, the returning of awards by writers and artists, refashioning of history and appropriation of historical characters by political parties of all hues will find a resonance in the festival’s deliberations. The centenary of the World War 1 and the lessons it holds for world peace, as also the centenary of the Nightingale of India, Bharat Ratna M S Subbulakshmi will be discussed. A Carnatic classical concert of MSS’ trademark songs presented by her granddaughter Aishwarya Srinivasan, graced by MS Subbulakshmi’s daughter Radha Vishwanathan, will be an added attraction. Other themes will include mythology, advertising, history and biography, the Partition, contemporary politics, young adult literature, cinema, poetry and crime. This edition will feature an eclectic range of authors and speakers, including several distinguished names like Javed Akhtar, Chandrashekhara Kambara, Shashi Deshpande, Sarah Joseph, Upamanyu Chatterjee, M J Akbar, Devdutt Pattanaik, Barkha Dutt, Nandan Nilekani, Jairam Ramesh, Ashutosh, Piyush Pandey, Ramya, Padma Rao Sundarji, Prakash Belawadi, Anuj Dhar, Lakshmi Vishwanathan, Radhavallabh Tripathi, Jaishree Misra, Sambit Patra, Maya Mirchandani, Shatavadhani R Ganesh, Siddharth Dhanvant Shanghvi and others. A sizeable contingent of Kannada voices will discuss and debate the state of the language, its future and also various aspects of the rich linguistic and literary traditions of Kannada. Notable among them are Narahalli Balasubramanya, Dayanand TK, Arif Raja, KN Ganeshaiah, Diwakar S, Kanaka Ha. Ma., Tulasi Venugopal, Prajna Mattihalli etc. True to the festival’s moorings, several city-based writers like Jahnavi Barua, Zac O’ Yeah, Preeti Shenoy, Andaleeb Wajid, Rachna Singh, Poile Sengupta, Shoba Narayan, Milan Vohra, Sharath Komarraju, Mani Rao, Asha Francis, Nandita Bose and others are participating, as also are young voices of Indian Writing in English like Durjoy Dutta, Ravinder Singh, Manu Pillai, Aanchal Malhotra, Viral Shah, Rupa Gulab, Mona Verma, Manju Jaidka, Manjiri Prabhu and others. In association with the Sahitya Akademi, the Festival brings to Bangalore compelling voices from the rich world of Indian languages –Dr. Radhavallabh Tripathi (Sanskrit), Dr. Subodh Sarkar (Bengali), Dr. Mohammad Zaman Azurdah (Kashmiri), Dr. Mridula Garg (Hindi), Vaasanthi (Tamil), Madhurantakam Narendra (Telugu), Sarah Joseph, Sangeetha Srinivasan and Janaky Sreedharan (Malayalam), Paramita Satpathy (Odia), Rakshanda Jalil (Urdu) and several others. The international authors/speakers include Haroon Khalid and Anam Zakaria (Pakistan), Stephen Kopetzky (Germany), Joao Tordo (Portugal), Emily Holleman (USA), Anne-Marie Kenessey (Switzerland), Giles Hazelgrove (UK), Neal Hall (USA), Per Bloch (Denmark) and others. For the first time, BLF is coming up with a Literary Award in conjunction with Atta Galatta, the city-based bookstore and art-literature space brought to life by Subodh Sankar and Lakshmi Subodh. Atta Galatta is also the Official Festival Bookstore. The awards carry a total purse of Rs 2 lakhs under the 3 categories of -Best Fiction (English), Best Non-Fiction (English) and a Literary Achievement Award in Kannada. The judges are eminent writers Usha KR, Vivek Shanbhag and Harish Bijoor. The award is an original sculpture titled “Thought Beyond Words”. The idea is to showcase how creative insights precede their translation into language. The sculpture depicts the mind as a tree and thoughts as birds. Birds come and go to the branches of the tree. Some fleetingly, some with more persistence. Some birds will take up residence in the tree, build a nest in its branches and giving birth to more thoughts. 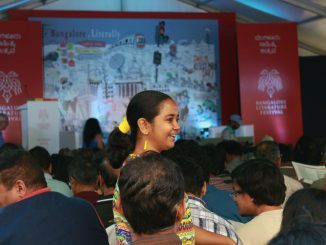 As the only literature festival that has structured sessions for children and young adults as part of the ‘Makkala Koota’, BLF continues to wow the younger ones in the audience with interesting activities like writing workshop, mythology quiz, audio-visual storytelling with live sketching, cooking your story using puppets and doodle your wall. With Amar Chitra Katha, Pratham, Duckbill and Bookalore, performance storyteller Vikram Sridhar brings together a treat for children of all ages. Languages are scarily getting endandered in an increasingly globalised world. Being alive to this problem, BLF in associaiton with film makers Jenny Pinto and Ratnottama Sengupta will be curating a round-the-clock screening of national award-winning films in various endangered languages: ‘Byari’ (in language Byari, Director: Suveeran), ‘Orong’ (in Rabha/ Dir: Suraj Kumar Swarth), ‘Nachom-ia Kumpasar’ (in Konkani/ Dir: Bardroy Baretto), ‘Qissa’ (in Punjabi/ Dir: Anup Singh), ‘Ri’ (in Khasi/ Dir: Pradip Kurbah), ‘Crossing the Bridge’ (in Sherdukpen), ‘Pagdi – The Honour’ (in Haryanvi/ Dir: Rajeev Bhatia) and others. There will also be a panel discussion on ‘Why Speak of Little Languages In a Globalized World?’ featuring filmmakers, dancers, theatre persons and writers. Buoyed by the success of the unique concept of ‘Lit-Mart’ where aspiring authors got to make crisp three minute pitches of their manuscripts to an array of literary agents, commissioning editors and publishers, Lit Mart returns this year. Entries are to be made by aspiring authors on our website and social media page and the shortlisted candidates will be asked to make their final pitches to the panel of Jayapriya Vasudevan, Deepthi Talwar, Rashmi Menon, Ajitja GS during the festival. A main attraction in this year’s festival is a unique installation on World War 1 by Elke Falat from Germany. Based on a combination of historical material and a concentrated selection of artworks from Germany and India, it focuses on the effects, reception and historical narrative of the First World War and provides the opportunity for a re-positioning. In the process, diverse historical strands are taken up and carried to the here and now. Alongside the special prisoner-of-war camps, the exhibition focuses its attention on the search for traces in India and Bangalore. While most of the soldiers came from Northern India, men from Bangalore also took part in the war as members of the Mysore Imperial Service Troops. It should be noted that Bangalore was decidedly influenced by the British military and is still an armaments production site. The so-called “Bangalore Torpedo” was manufactured here during the First World War. Partners this year include the Government of Karnataka- Departments of Tourism and Kannada and Culture, Microlabs, Goethe-Institut/Max Mueller Bhavan Bangalore, Sahitya Akademi and Symbiosis School of Media and Communication. The Festival opens at 9.30 am on both days with sessions going on through the day across two parallel sessions on the green lawns the charming Royal Orchid Hotel. Entry is free and open to all via registration on the website www.bangaloreliteraturefestival.org and via Facebook and Twitter on #BlrLitFest. Pre-registration is highly recommended. A celebration of literature, this festival also seeks to commemorate the creative spirit of Bangalore and literary diversity of the city offers by engaging it in conversation with the best minds in the world of literature from both within and outside of India. In just three years of its inception, BLF has emerged as the second largest literary conclave of the country. Nearly 350 authors/speakers have participated and about 25,000 audiences so far. Over the past 2 years several stalwarts like Gulzar, Pavan Varma, U R Ananthamurthy, Shashi Deshpande, Ramakant Rath, Ashokamitran, K Satchidanandan, Chandrashekhara Kambara, Nabaneeta Dev Sen, Rajmohan Gandhi, Anita Nair, Shobhaa De, Jayant Kaikini, Dr MM Kalburgi, Dr Venkatachala Shastry, Dr Narahalli Balasubrahmanya, Vasudhendra, KS Bhagawan, HS Venkatesh Murthy, Dr. Nissar Ahmed, Dr Siddhalingaiah, Chetan Bhagat, Amish Tripathi, Nabaneeta Dev Sen, Ramachandra Guha, Arun Shourie, Swapan Dasgupta, Rajiv Malhotra, William Dalrymple, Ashok Vajpeyi, Mark Tuly, Tavleen Singh, Prasoon Joshi, Rakeysh Omprakash Mehra, Farhan Akhtar, Bhawana Somaaya, Ashwin Sanghi, Nasreen MunniKabir, Ian Jack, Bas Bottcher, Babar Ayaz, Shehan Karunatilaka, Ashok Ferry, Farah Ghuznavi, Baradwaj Rangan, Ravi Subramanian, Nandan Nilekani, Wendell Rodricks and others have engaged in fascinating literacy tête-à-têtes on this platform. This initiative by a group of authors and bibliophiles of the city is led by authors Vikram Sampath and Shinie Antony and social venture professional Srikrishna Ramamoorthy. The objective of the Bangalore Literature Festival is to put together a literary experience that brings writers – both established and aspiring, readers, publishers, students and young professionals and other stakeholders of the city together on a common platform and create a compelling space for engaging and thought-provoking discussions on literature and life. Bangalore Literature Festival – 2013 will be held from September 27 to 29, at Jayamahal Palace. Vikram Sampath, co-founder of the fest, talks about books, literature fests and more.